Château d'Yquem is one of those mythical wines, known throughout the world by name and bearing a unique imprint in the style of the prestigious estate. The legend of this exceptional Sauternes goes back through 400 years of history. Thanks to the archives of the chateau and the Gironde department, early records already attest to a certain way of managing the vineyard and the practice of late harvest at Yquem from the end of the 16th century. The chateau and then the vineyard were managed under the influence of the Sauvage family. Françoise Joséphine d'Yquem married Count Louis Amédée Lur-Saluces in 1785. Following his death three years later, she took over the estate, gradually transforming Château d'Yquem into a property with a borderless reputation. The hard work of Lady Yquem was rewarded only after her death. In 1855, Château d'Yquem became the only property recognised as a Premier Cru Superior, under the official classification established at the request of the Emperor Napoleon III for the World Fair in Paris. Since then, Château d'Yquem has entered a new era, thanks to the acquisition of the property by the LVMH Moët Hennessy-Louis Vuitton group. Of the 113 hectares of vines belonging to Château d'Yquem, only a hundred are in production, with Sémillon representing the majority of the grapes planted (75%), supplemented by Sauvignon Blanc (25%). Château d'Yquem benefits from an exceptional micro-climate whereby the Ciron, a small tributary of the Garonne, plays a decisive role in the development of noble rot. It is thanks to the morning fogs of autumn that Botritys cinerea grows on the bunches, drying them out and concentrating the sugars and aromas within. Château d'Yquem is famous for having mastered the process of harvest through successive sorting. 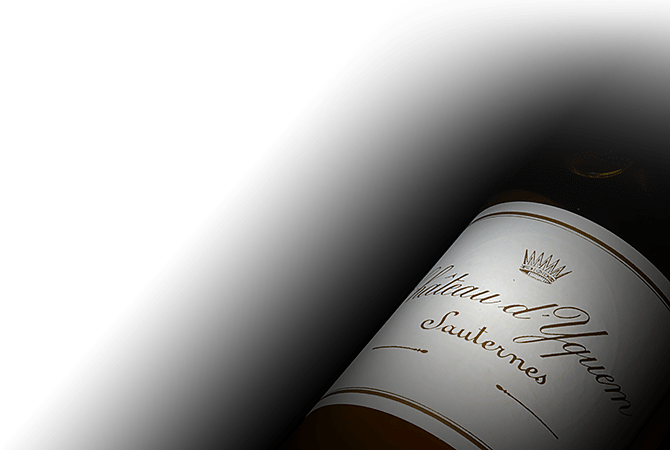 From vineyard work to bottling, the production of a Sauternes wine from Château d'Yquem illustrates a know-how requiring an extremely long process, with close attention paid at each step. With a yield limited to one glass per vine, Château d'Yquem is a Sauternes wine whose rareness contributes to its prestige. Their eponymous wine is recognisable by its aromatic expression, unique texture and lingering length on the palate. The young vintages display the expressiveness of fruity notes, with aromas of apricot and orange, sometimes evolving woody notes of vanilla or toasted bread, towards the light spicy touches of cinnamon, saffron and liquorice. Designed to be kept, the Sauternes of Château Yquem evolves sumptuously throughout time, developing delicious flavours of dried and candied fruits, delicately chiseled by the freshness of floral notes. Harmony, balance, complexity and finesse, the Sauternes of Château d'Yquem is a style in itself.